Following this morning's announcement from Apple that it will officially begin rolling out its "CarPlay" iOS vehicle integration with Ferrari, Mercedes-Benz and Volvo on board as the first launch partners this week, Volvo has published its own press release announcing the launch. Volvo's promotional materials include a new video briefly showing off CarPlay in action. Volvo also goes a step beyond the basic CarPlay implementation to take advantage of the large portrait touch screen on the upcoming XC90 SUV, making both Apple and Volvo controls available simultaneously. 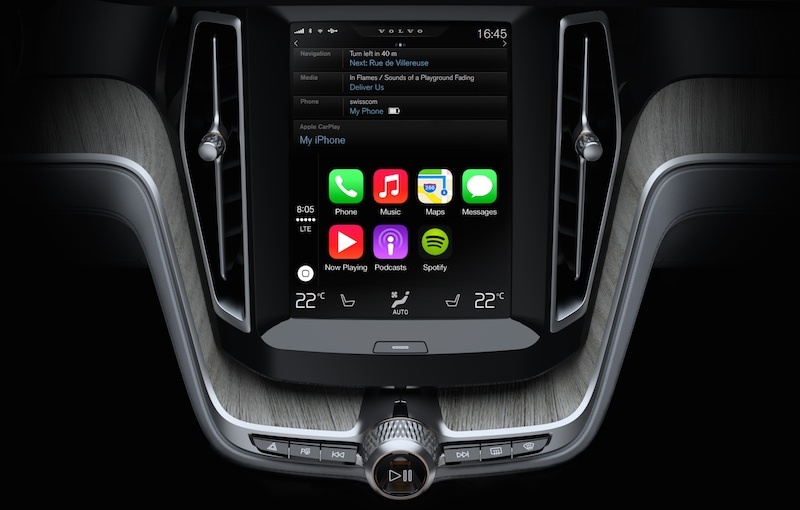 Volvo enhances Apple’s capabilities by linking them to a specially-developed interface that allows drivers to use voice and touch controls to access Apple features and services, ensuring the entire interaction is always safe and easy to use. Volvo's press release also makes clear that while the initial implementation of CarPlay will require a wired connection using an iPhone's Lightning connector, Wi-Fi connectivity will be "coming in the near future". You can tell Jony Ive is excited for this, did you hear how high his voice got? Who else thinks this is a bad idea? While driving you need to watch the road, not try to hit the right part of a touchscreen which is in a place where your arm doesn't usually go. In my experience it is much much safer and easier to control the infotainment system with a couple of buttons and a scroll wheel (like Audi). You can use that too. And of course you can just tell Siri what you want without taking eyes off the road at all. Three ways to control, that's pretty versatile. I just hope the lawsuit-fearing developers creating this don't restrict the ability to use it while the car is in motion. I LOATHE systems that do this. Especially since it's often my passenger who is modifying settings, unable to do so because I'm driving. Just let people do things while the car is moving. We've been setting our radio stations, adjusting the A/C and such for YEARS while driving without issue. Why do we have to be told we can't now? I hate our legal system and the way it penalizes entities that are not at fault for people being stupid. I wonder how long it will be before we see aftermarket headunits supporting this. In theory they should be cheap as it seems like the screen is 'dumb' and everything is powered by the phone itself meaning the headunit is only really a screen and an amplifier. I can't wait to jailbreak it and get apps on there, driving at 75 mph while playing flappy Bird, look out people ! Am I the only one GEEKING out over the fact this Volvo commercial features the death metal band IN FLAMES on the screen? hahahah! I LOVE this!